The news is full of stories of sexual harassment and abuse these days. Women are standing up, speaking out, asking to be believed as they uncover stories they had silenced, hidden away out of shame or not wanting to rock the boat, or simply to keep their job. Millions of women are finally airing their pain and asking to be heard. Courage in numbers, they say. It reminded me of my first trepidatious year in Creative Writing Class, writing a taboo journal that was to become my first book 10 years later. (a book of poems and birth journal, Little Mother published 1997). 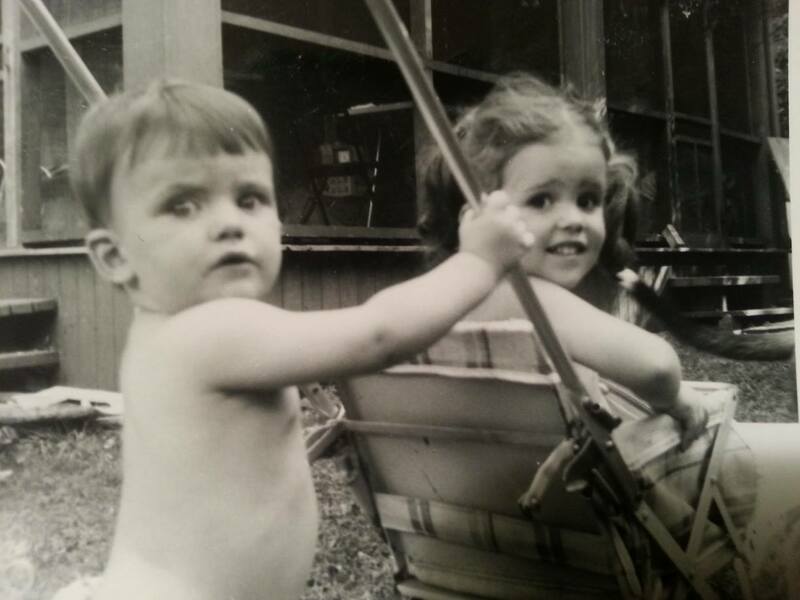 I remember mixed feelings about giving a voice to my female body. 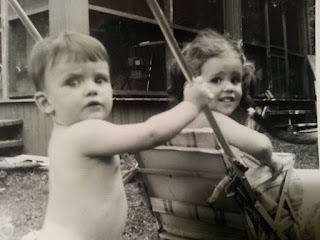 I had stories to tell, some of them about being pregnant, which I loved, and yet, it brought up scary dreams and I realized there were unconscious fears, especially as I got to the week before giving birth to my first child. I was reading a lot about labour, of course, and what to expect. Also I was trying to understand how past sexual abuse or trauma to the body could delay or obstruct the labour process. I wholly wanted a "natural" childbirth, (having no idea what that meant). But in the effort to be cautious and prevent an oversized child, I was scheduled to be induced on Sept 19, my due date. After twelve hours of 'false labour,' and many derogative remarks from the two women obstetricians about my lousy, tight, stubborn cervix" I went home and tried to get my head around the resistance of my "failed induction". I had a feeling my uterus wasn't stubborn, it just knew it wasn't time yet. (I ended up dancing to African drum music a week later to get labour started). Sept 21, 1990: When God cursed Eve for eating the apple, he decreed: "In pain you shall bring forth your children." Our heritage as women. I want to look at my fear of pain, reasons for tightness. doctor's hurtful examinations: forcing a cold metal speculum when internally bleeding (ectopic pregnancy, age 22 years). amniocentesis: another violation, but by needle. Hanging on tightly to this pregnancy, fear of losing the fetus. I have to say goodbye to "Eustache" [foetus name] and hello to the separate new individual, Andre-Julien, the child-boy. Leave behind the known for the unknown. Birth = rite of passage. A Rupture. "The best way to get out of pain is to go into it." Say yes, accept. (advice from L'une a l'autre, Winter 1987, magazine for midwives). I did not list all the ways I had felt invaded sexually, including an encounter in which I bit a man's arm so he would let go of me....but I was becoming aware that there was a connection between the fear of invasive "others" and my body's natural power to give birth. 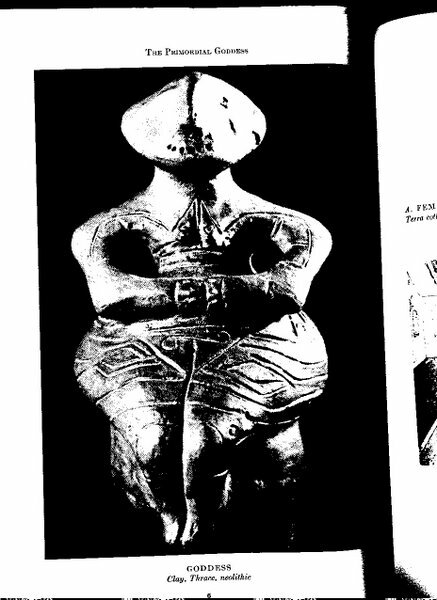 The whole book was a form of meditation on taboos surrounding the female body, sexuality and mothering. The question I have now is, is it even safe to be a female in this 20th century? perhaps safer in Montreal than in Mogadishu, Somalia. It seems like not enough has changed since I was a little girl or a teen aged one trying to negotiate her sexual boundaries. Maybe none of us is safe until we speak up, speak out and use our body language to clearly communicate what is out of boundary, what actions and words we refuse to acquiesce to. Even grown women need to learn this, and not adhere to the old "polite, good girl" behaviour, not stay silent and squirm with shame or rage. What I wish is that I had been coached on this as a child, instead of being told to be quiet, stuff my feelings inside, be good. Sure, we got the warnings about strange men and not talking to anyone we didn't know. But unfortunately, often it's the people you do know that are hard to say no to. The older brother, the babysitter, the uncle, the fathers and grandfathers, the step-fathers and friends of the family. I wish the world were a safer place for women. Let's start by telling our stories, using our voices, standing up for ourselves. Warrior Women find your Courage! Let all girls find their voice, be encouraged to defend themselves. May all boys be taught how to stand up for their sisters and friends, as well as themselves. There is a latent memory deep inside my soul of a kind of knowing, call it feminine intuition if you wish, a kind of ringing in the ear and buzzing in the chest that signals Presence, the numinous, or entering sacred ground. 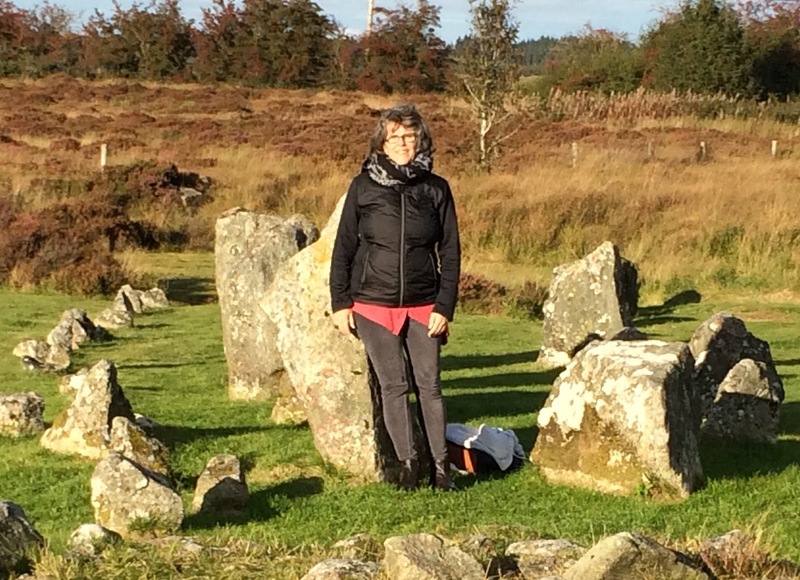 On a recent pilgrimage to the sacred sites and stone circles of Ireland with Amantha Murphy at Celtic Soul Journies, I felt a lot of that buzzing, and rediscovered the magic of fairy glens. Some part of me, deeply slumbering, was awoken. 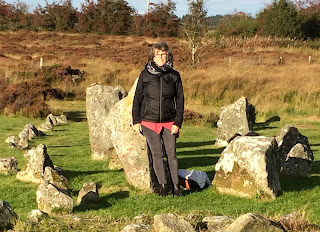 Ostensibly, I had flown to Belfast to be with this group of ten women in the land of my feminine lineage, to learn more about the Celtic Wheel, the goddesses and mythology of the land. I had no idea what Celtic Shamanism was about, but I was very intrigued by discovering something more about the land of my ancestors. 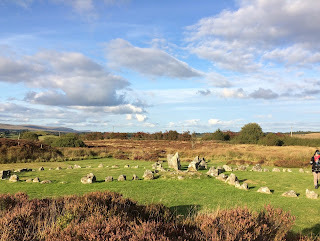 I was also intrigued by the description of the Celtic Woman’s Path - getting to know the deities, the Celtic Wheel of the year and the seasons, and how to access and deepen our communion by opening ourselves to Sacred Ceremony and Ritual. I was not disappointed - my inner child was delighted with the discovery of magical fairy glens, mossy covered rocks and trees, and exploring the connection between the feminine life cycle and the land. As well as exploring two famous landmarks: the Giant's Causeway (one of the eight wonders of the world) and the Cliffs of Moher, a truly misty, mystical experience of ocean and rock cliffs. The biggest revelation, however, was how 'things' like rocks can speak to us. Wrapping my arms around a huge dolmen in the middle of a field, the ancient rock covered in lichen and smelling of the sea, I meditated on my origins and somehow sensed the ancient sea that had covered this land, eons ago. There were moments tramping through tall, wet grass and fighting our way through blackberries and brambles that were less romantic, but the feeling of being rooted to the earth, and connected with Spirit, was very strong. I was there to receive messages from Spirit, and renew my belief in women’s magic. At the end of one afternoon, after tramping around and through seven stone circles in one field, we sat in our own circle around an ancient pile of rocks or cairn, and re-remembered the women’s rites for birthing and dying. We sang, ‘The Goddess is alive and magic is afoot!’ while waking in a circle. Then we switched directions, walking widdershins around the stone circle, asking for a dream, a memory, a song or something to come through. I left a gift inside the cairn, letting my little gold painted rock fall inside the pile of dark rocks, down a crevice, to feed the dragons underneath perhaps. Sounding, voices and inner focus filled my heart, despite the chilled bum from sitting on damp grass. I felt blessed to have someone so knowledgeable about the myths and stories of the land with us. After three or four hours of drumming, ceremony and reimagining women’s ritual in the birthing and dying places, it was time to go home and have tea. We often met in the morning before our treks into the countryside to attune, to sit in silence, then speak from the heart, and perhaps sing a song or two before getting on our mini-bus. Every day was a new adventure, full of surprises. One morning, after slipping down a very muddy, wet path into a lower level of ancient rock and moss-covered trees in The Glen, on the side of Knocknareaa Mountain in County Sligo (http://www.atlasobscura.com/places/ireland-glen-knocknerea), we sat and listened to an insistent drum beat while we journeyed inwards towards the ancestors. I saw flashbacks from my childhood home, saw myself playing in the woods outside, and then heard voices singing on a hill, around a fire at night. It was hard to tell if the voices were inside my head, or coming from inside the drum. Note from my journal: The split between the logical side and the intuitive one is sometimes painful, the harsh inner critic so loud. Yet, she feels herself melting, she sings, she opens, she forgets her separateness, her defenses disappear or melt into the constant rain, the green green moss enchants and delivers her over to the silent space just between head and heart, the observer self, the open-handed receiver, the Feminine, the wonder it is all here, only a breath away. It was a strange and wonderful journey – we not only communed with fairies and spirits, but shared delicious meals in restaurants or the homes we stayed in, making new friends in friendly conversation on one level, and dancing with the fairies on another. 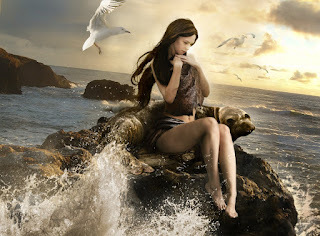 A seaweed bath in Strandhill spa was another kind of magical moment, calling up the selkie in me. In a private session with Amantha, I learned that intuition and dreaming are strong in me, and to trust the energy of things: rocks, trees, but also inner feelings. The woman's creative center or womb is a source of guidance - I can ask inside about how I feel, and if those feelings belong to me. Guidance is always available. I am learning to trust my inner knowing and let nothing get in the way of that. Remembering the ancient ones, the women and their wisdom! On my return, I pledged to keep an open heart and mind and resist withdrawing and hiding myself away. Now my challenge is to find the magic in my own ‘home’ landscape. With the changing leaves and colours, that shouldn’t be too hard.